Dustin Hoffman picked a pretty safe subject for his first directorial role, and I think he knows that. There is nothing controversial or challenging about this film set in a home for retired musicians, and nor frankly does there really need to be in a heartwarming story of this nature. What’s harder to forgive though is the lack of meaningful plot complications and the almost nonexistant character development. Sure the characters trundle along from A to B, but they do so far too easily and the journey they go on to get there is extremely thinly painted. I support the film’s stance where it doesn’t diminish older people, but it does fall rather flat in giving us characters to really root for. Hoffman’s direction feels controlled here for a debut; it’s smart even if not particularly adventurous as it sets about displaying its cast in a warm glowing light. In fact it’s here where we feel that Hoffman is most invested; in the assembled array of respected older actors, musician and singers. 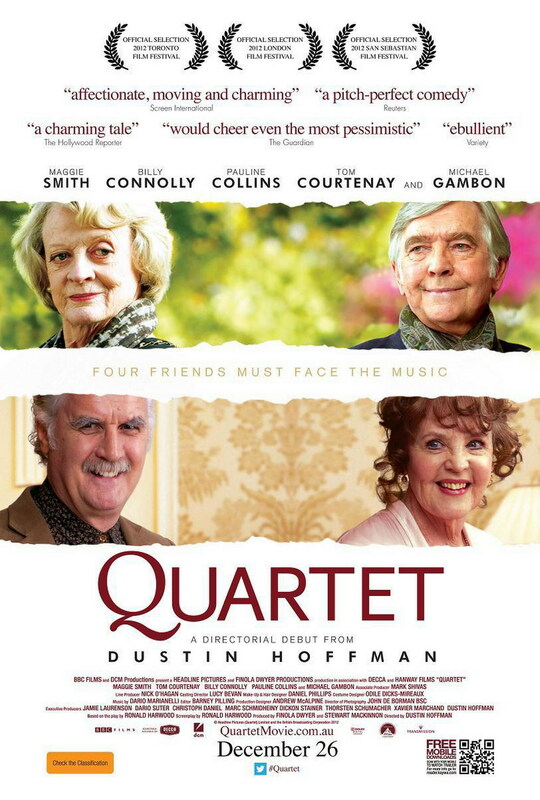 In showbiz and its performers, the thrill of being on stage, the fears of losing your talent and receiving the feedback of harsh critics… it’s this aspect of the film which Hoffman paints so lovingly throughout Quartet. 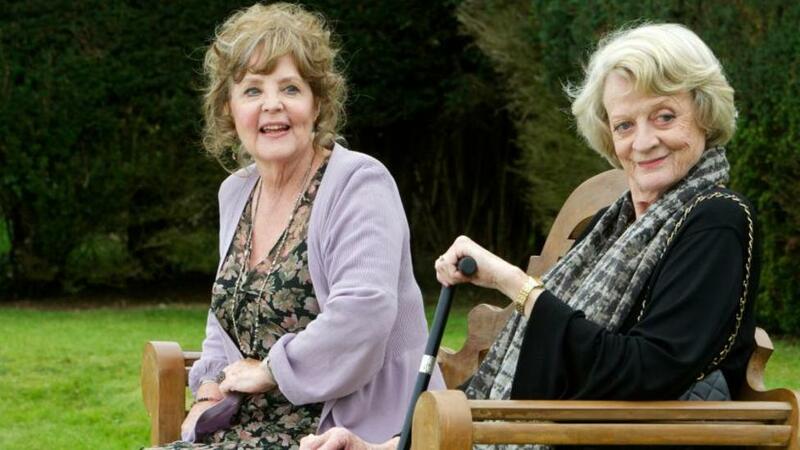 The film’s cast perform well in their respective roles with actors like Billy Connolly and the late David Ryall providing a light comedic underpinning for the more touching drama stories to play out between actors including Maggie Smith and Tom Courtenay. Although of course every actor gets the chance to infuse their character with humour of some kind, after all what film nowadays can resist giving Maggie Smith the chance to use her sharp wit? The big problem I have here is with the film’s two central plots, neither of which is well developed. One is the reuniting of two lovers who have long since parted ways and who have to work through a lot of pain over the course of the film. The second plotline concerns an upcoming performance which is needed to raise money to save the home from being closed. Without giving away plot details all I will say regarding the story of the two lovers is that it initially holds a lot of promise, but then the script loses steam and sinks into predictable and thinly drawn convention. The story about the home being under threat never feels particularly developed at all. We are told it is at risk of closure but we struggle to really believe it when we see the majesty of the house and when no perceivable threat is ever made against the building or its inhabitants. It just never really feels like a big problem in the film, and certainly doesn’t impact upon the characters in any meaningful way. So whilst I am loath to slam this film due to its good performances and general easy charm I can’t exactly recommend it either. This is the sort of film which you can sit down to on a Sunday afternoon if you’re looking for something uncomplicated to watch that will gently tug on your heart strings. However if you’re looking for a film that depicts older people as not just being full of life but complex as well, you had better look elsewhere. If Quartet had paid just a little more attention to its characters and fleshed out their relationships with some more depth then this could have been something rather special. What is the film’s greatest strength? The film’s refusal to diminish older people. Its greatest weakness? A rather uninspired script. Would I see it again? Not really, it was pleasant enough but there isn’t enough here for a second helping. Thanks for reading, please share your thoughts in the comment box below! Good review Rumsey. It’s charming, I’ll admit. But that’s about it. Thanks, yeah it could have been better couldn’t it!